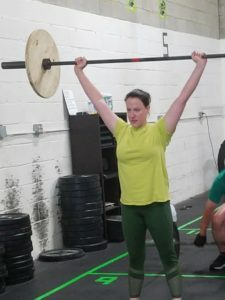 I came to CrossFit after hearing about this job opportunity^^ that required passing a physical agility test, I began to attempt to train on my own. With failed attempts and little to no improvement, I reached out to Butch for personal training. My first impression was being nervous and intimidated, and after seeing what my base starting point was, just felt weak. I thought there was no way I was going to reach the strict goals I set for myself in such a short amount of time. I was also scared to death that I was going to hurt myself. I have suffered back pain for years and have been so sedentary that I really didn’t think I had a chance. I wanted to see how capable my body actually was. I am not nearly as nervous to try things and I’m not afraid to cheer people on or ask for help. There are several goals I hit. I would say the first goal was push-ups. I was so focused because I started with little to NO upper body strength. My test required 18 in a minute and in 5 short weeks, I was doing 18 in 30 seconds. Compared to when I started I now feel stronger and much more energized. Because of diet change (key!) and making the time to work out, I have gained strength and remain determined to keep going forward with my health and strength. The biggest change so far is my attitude about being able to do things and not being afraid of being in pain. That’s what doctors are for!! The last time I was really in a lot of pain was Summer 2016. I was afraid to do anything, was eating Tylenol like candy and just became lazy out of fear.